GSM/GNSS 2 click combines GPS/GLONASS location tracking with GSM module capability for mobile communication. The click carries SIM868 quad-band GSM/GPRS module. 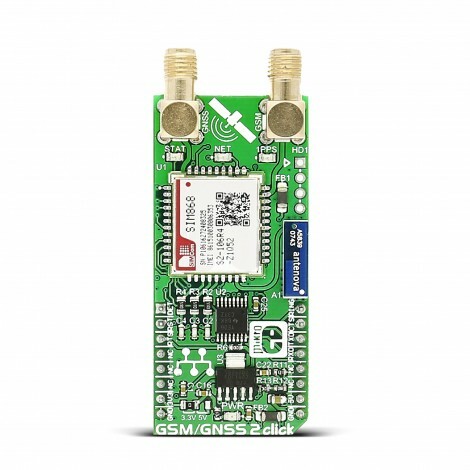 GSM/GNSS 2 click is designed to run on either 3.3V or 5V power supply. It communicates with the target MCU over UART interface. 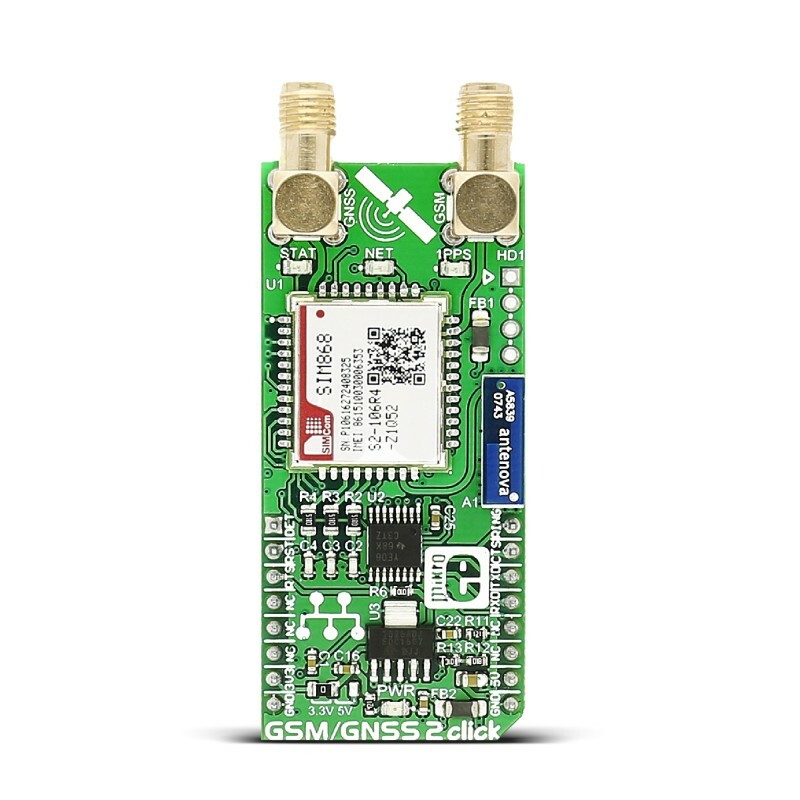 GSM/GNSS 2 click combines GPS/GLONASS location tracking with GSM module capability for mobile communication. The click carries SIM868 quad-band GSM/GPRS module. 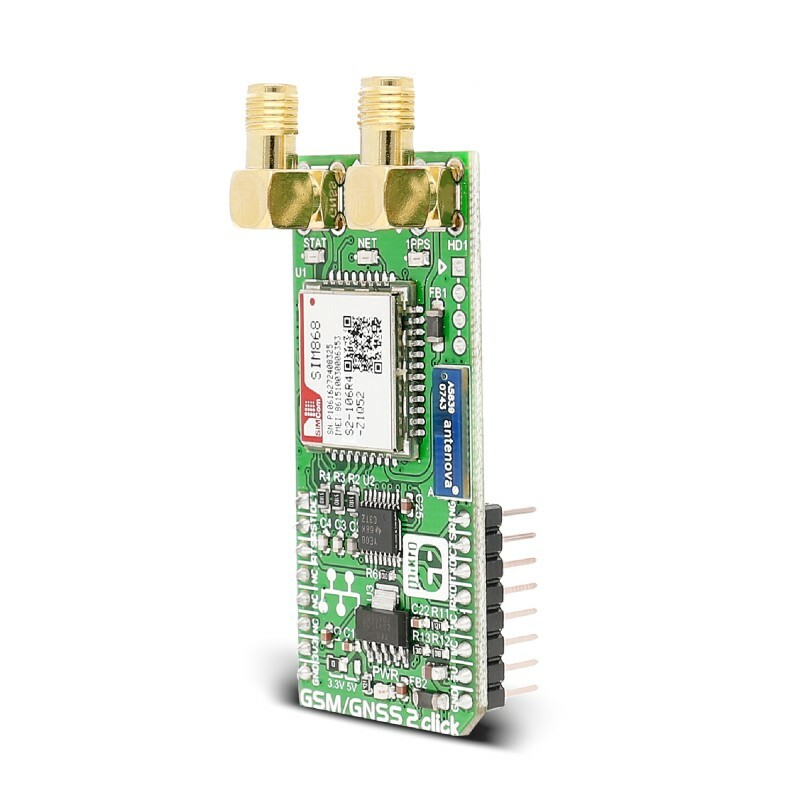 GSM/GNSS 2 click is designed to run on either 3.3V or 5V power supply. 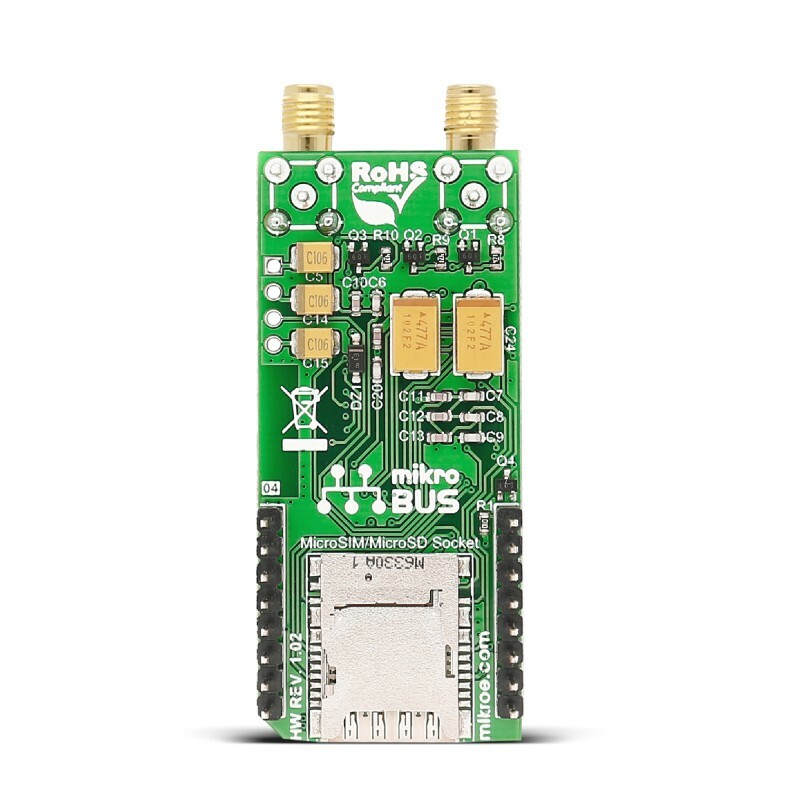 It communicates with the target MCU over UART interface with additional functionality provided by the following pins on the mikroBUS™ line: AN, RST, CS, PWM, INT. When connected to a GPS antenna, it can receive GPS coordinates, time, and other information from orbiting satellites. SIM868 is integrated with a high-performance GSM/GPRS engine and a GNSS engine. SIM868 is a quad-band GSM/GPRS module that works on frequencies GSM 850MHz, EGSM 900MHz, DCS 1800MHz and PCS 1900MHz. SIM868 features GPRS multi-slot class 12/class 10 (optional) and supports the GPRS coding schemes CS-1, CS-2, CS-3 and CS-4. The GNSS solution offers best-in-class acquisition and tracking sensitivity, Time-To-First-Fix (TTFF) and accuracy. SIM868 is designed with a power saving technique so that the current consumption is as low as 0.65mA in sleep mode (with GNSS engine powered down). GNSS stands for Global Navigation Satellite System, an umbrella term that describes both the United States GPS and the Russian GLONASS global positioning systems. GLONASS is an acronym for Globalnaya Navigatsionnaya Sputnikovaya Sistema (Global Navigation Satellite System). GPS currently has 33 satellites in orbit, and GLONASS has 24. This two-constellation system is particularly suitable for urban areas with high-rise buildings and complex environments. GLONASS is suited for usage in high latitudes (north or south), where getting a GPS signal can be difficult. Applications Navigation, surveying and mapping, asset tracking, etc. This table shows how the pinout on GSM/GNSS 2 click corresponds to the pinout on the mikroBUS™ socket (the latter shown in the two middle columns). Code examples for GSM/GNSS 2 click, written for MikroElektronika hardware and compilers are available on Libstock. This code snippet initializes the MCU and the module. It first sends an initial message to the user and then logs an events such as calls or messages on the microSD card and reads the current GPS location, all in an infinite loop.